Finally got to visit the much talked-about Kuala Gandah Elephant Conservation Centre in Pahang a few month’s ago! Thanks to David, our elder son who kindly volunteered to drive and accompany us, knowing that his parents have never been there before. The casual drive from Kuala Lumpur took a little over 2 hours and we reached our destination around 10.15 am. 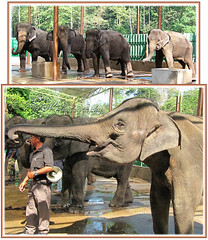 The Elephant Conservation Centre at Kuala Gandah, located within the bio-diversified wilds and protected region of Krau Wildlife Reserve, was established in 1989 by the Department of Wildlife and National Parks (DWNP) as a permanent base for the Elephant Capture and Translocation Team that began the elephant translocation programme in 1974. The only one of its kind in Malaysia, this Team is dedicated to locating, subduing and translocating wild elephants where their habitats were encroached by plantations or other human development, to other suitable habitats throughout the Peninsular such as Taman Negara. The dedicated team has helped to prevent the further decline of these gentle mammals, the Asian Elephant (Elephus maximus) and relocated more than 500 wild elephants thus far. At the visitors information centre of Kuala Gandah Elephant Orphanage Sanctuary (its other popular name as orphaned elephants in the wild are captured and tendered here too), you get to enjoy a video presentation on issues affecting the wild elephants, their diminishing habitat and translocation, as well as glimpse through informative wall posters on various elephant-related topics/activities. Visitors to the Elephant Sanctuary are welcomed to participate in the daily activities, like elephant-riding, feeding and grooming the elephants or helping with the bathing of the animals in the nearby stream. The latter being done around 3pm, so we had to miss out on this event as David had to return home early for other engagement. These activities usually commence from 12.30pm onwards. We were fortunate that a busload of Japanese tourists coincided with our visit that weekday morning, otherwise just the three of us wouldn’t have been much fun, I think! Hence, we were all properly attended to by one of the centre’s staff who explained much about the Centre, its establishment, mission and efforts, etc. with a loud hailer and led us through the other activities available. Four young elephants with their respective trainer were led close-by to show us some tricks and basic commands that they’ve learnt. Amazing to observe each trainer whispering the commands into the elephant’s ear…intelligent creatures, huh! Really fun to see these gigantic creatures up-close, the minute details unseen usually from afar and to feel their roughened and bristled skin, not to discount the many precious photos captured. Lovely too to see the excitement and thrill on the faces of the visiting crowd, especially the ladies with their giggles, smiles and chattering as they ‘queued for photo shoot’. Fun-time included feeding the larger elephants, four of them that were under the covered shelter. More giggles and laughter followed as we took turns feeding the elephants with sugar-canes! 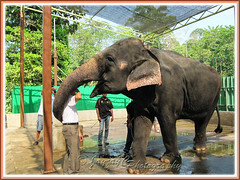 Incidentally, I just love this candid shot (the left picture below) of my beloved hubby being given a body pat by the gentle and grateful elephant after being fed with a piece of sugar-cane…such a loving and sweet gesture by the largest mammal among the lot seen that morning! 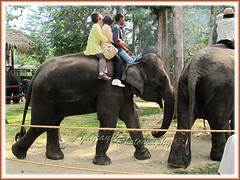 Activities continued with the elephant rides with further excitement from the Japanese crowd. Though we didn’t opt to ride the elephant, it was fun just watching and taking snapshots! We left the Elephant Sanctuary before midday and headed straight for Karak for lunch at Restaurant Yik Kee that is popular for its roasted duck and durian-filled pastries. 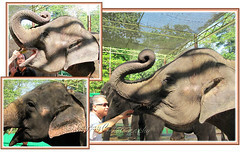 For John, my beloved and I, it was truly an enjoyable and enriching half-day trip, well-spent too with our loving son, David who had been to this Elephant Sanctuary, three times before. A big thank you to the dedicated staff of the Kuala Gandah Elephant Conservation Centre for their timeless dedication and caring efforts for God’s gentle and magnificent creatures, The Elephant! Opening hours: The Centre is open from 8.00am to 4.30pm daily but activities mostly begin from 12.30pm onwards to 3.45pm. Entrance is free though donations are most welcome. Advisable to make prior reservations or visit early for elephant rides and bathes activities as quota per day is 120 persons only for these two activities. From Kuala Lumpur, take the Karak Highway heading towards Lancang District, passing the Karak Village along the way. At Lancang, turn left into the road just before the BP station, then follow the ample direction signage towards the Elephant Sanctuary. You will pass an Orang Asli settlement before reaching the Kuala Gandah Elephant Sanctuary. The 160km road journey from Kuala Lumpur takes about 2-2.5 hours. Sir David Attenborough said, "If elephants are to survive, human beings will have to be convinced that these magnificent, intelligent creatures are entitled to retain some share of the living space left on earth." There are two main species of elephants in the world, that is, the African Elephant (Loxodonta africana, the largest land mammal) and the Asian Elephant (Elephas maximus) which is slightly smaller than its African relatives. Currently, the Asian Elephant is listed as a critically endangered speices, with less than 40,000 wild elephants in Asia and a maximum of 1,200 in Peninsula Malaysia. Tusk: Most males have tusks though some have no tusks. The female usually has none, and if present at all, it’s barely visible. What a fun and educational trip it has been. I have read about it but never visited yet. I’m so glad our country has such wildlife sanctuary for the animals. My warmest regards to your family members. Yes, if you’re a nature and wildlife lover. Hope you get to visit it someday, Autumn Belle. And, thanks…our best regards to you and family too. I’m the Guide of a group of tourists from Germany and Switzerland. We made the trip to Malaysia by road with motorhomes through Russia, Mongolia, China, Vietnam, Kambodcha and Thailand to Malaysia. At the moment we are back in Europe an our tour back by car will start in February. We will be back on 4th of February in Melakka and we will be at your park late afternoon on the 5th. We would like to stay there 1 night and seeyour Park in the Evening and on next day. Please may you give me informations about the park and the posibilities for us. What can we see, what can we do? Sorry, we’re not a tour agency, Eberhand Utz! We were just first-time visitors to the elephant centre for a few hours and simply shared here our pleasant experiences. Please direct your enquiries to the National Elephant Conseration Centre at Kuala Gandah whose contact numbers are provided above. Alternatively, you may either want to contact ‘The Elephant Man’, whose email address can be found @ http://www.myelephants.org/ecotourism.html or google further for information elsewhere. Whatever, all the best to you and wish you and your group an enjoyable forthcoming tour of our beloved country. Thanks! A blessed, joyous and fulfilling 2011 to you too!